Crom! This inaugural volume ushers in Marvel's line of definitive Savage Sword of Conan collections. 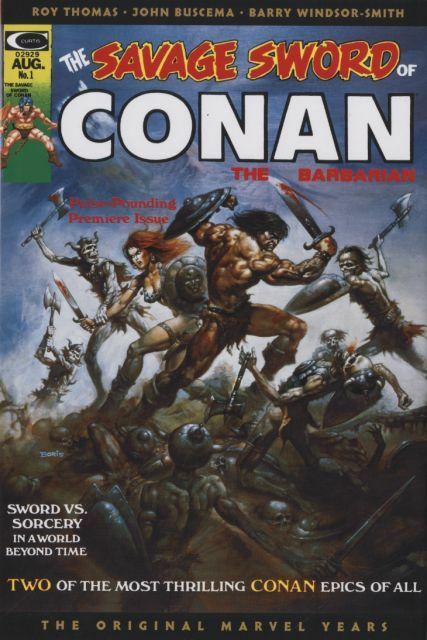 After the breakout success of Conan's color comic, Marvel brought the legendary sword-and-sorcery saga of Robert E. Howard's hero to its black-and-white magazine line. In lushly illustrated novel-length adventures with all the drama, violence and allure the comic book medium can offer, writer Roy Thomas and Marvel's greatest artists craft a host of Conan classics like Barry Windsor-Smith's 'Red Nails' and John Buscema's 'Black Colossus' and 'A Witch Shall Be Born' featuring the infamous Tree of Death are just the beginning!